Last night was our final meeting for 2015 and I think everyone enjoyed themselves. I’d like to say thanks to some of the stars of the evening. First up, I’d like to say thanks to Sean for bringing in his new gadget; it certainly attracted a great deal of attention and was a lot of fun. Sean, if you have a URL for your gadget, please let me know and I’ll edit it in here, I don’t want to say too much in case I give something away that I shouldn’t. 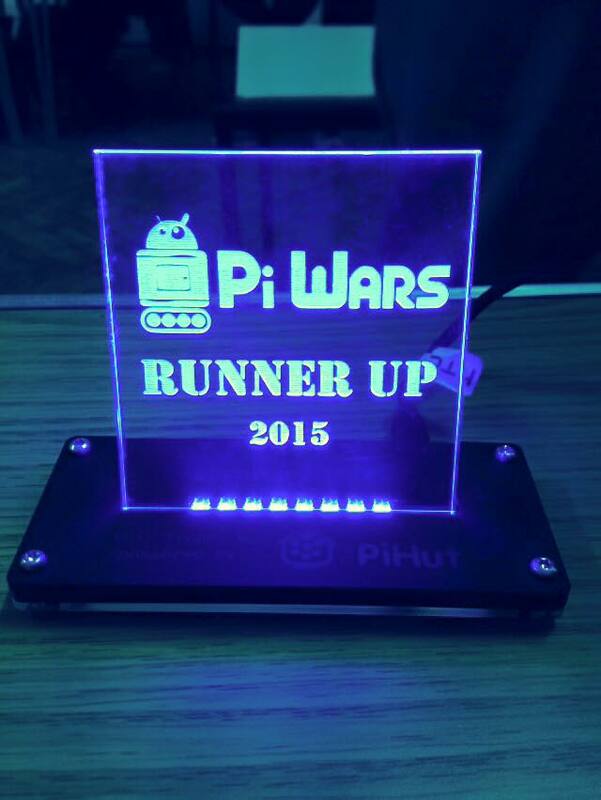 Next I’d like to say thanks to the PiWars team for bringing in TractorBot 20125 and their runner-up trophy. 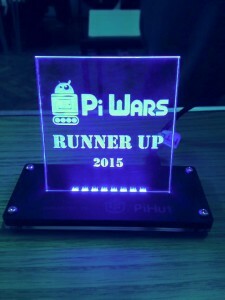 I think some of their swag may have crept into the quiz prizes too; I got a very handy Ryanteck IO expander which was nice. While I’m on the subject of quiz prizes, thanks to Tim for providing a mix of novelty and genuinely useful prizes. Topher seemed pretty pleased with his multi-tool and who wouldn’t love a gold wind-up toy robot? Of course, a big thanks has to go to Jon for organising the Xmas quiz again, it was funny and frustrating. It’s great to hear a room of techie types howling because they can’t remember what some of the acronyms that now run the world, or at least the internet, actually stand for. And of course we all learned something new in the name-that-tune round, except Phil, who got it in a heartbeat; ‘Sweet Home Alabama’ played on Tesla coils. This has to be seen to be believed, 500,000 volts arcing around making the old school sounds of Lynyrd Skynyrd. If that’s not enough, how about putting a person in between two coils, you know, to see what happens. Obviously those people know precisely what they’re doing, please don’t bbq yourself or the cat trying it out. What else did we learn? Oh yes, don’t give Vincent wine after dark, Amy knows the moves to the Macarena and I had a misspent youth. It was good to see some people returning after a bit of an absence, Alan, Simon, and Sean. Sean took time-out to get married, go on honeymoon and what not, congratulations Mr and Mrs Billings. Also a couple of new faces Sam and Peter, hope you both had a good time. Gary did his duty by rule #2 so big thanks to him, to Peter for helping out at his first meeting, and Sara for doing the drying. I’ll post the next meeting ‘real soon now’, but as a head’s up it’s going to involve some show and tell. Everyone is bound to get some new gadget over Christmas either as a present, when Kickstarter finally coughs out the PiJuice or when temptation gets too great for that thing they’ve been thinking about for the last six months. Bring along all Santa’s swag to the first meeting next year so we can all ooh and ah over it and add yet more critically important stuff to our wish-lists.